Cockney Sparrow sprang a surprise under 7lb claimer Dean Pratt to floor My Tent Or Yours in the QTS Scottish Champion Hurdle at Ayr. The John Quinn-trained mare came with a devastating late burst from the final flight to get up in the last 100 yards. Court Minstrel, who won this race 12 months ago, was two and a quarter lengths back in second, with the even-money favourite My Tent Or Yours, anchored by his big weight, another length and three-quarters away in third. Quinn said: "Dean knows her very well and I don't think she likes being crowded. He was very clever on her. When he switched her wide it looked like she might be placed, but then she quickened up again. She won here on the Flat and she's got tactical Flat speed. "We were going to keep her for the Grade One mares race at Punchestown, but it was six weeks away after Cheltenham so we came here first. She's a good ground animal so I'll keep her going until the autumn." Pratt added: "It worked out well enough. I missed the middle one down the back and I lost my position a bit so I gave her every chance turning in, and I had my eye on My Tent Or Yours and I could see AP (McCoy) pushing going to the last. "I knew this filly would stay and she galloped all the way to the line. She was only five lengths behind Quevega at Cheltenham and she would have been third if she had not been hampered. "I ride her out every day at home. 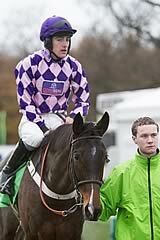 She gave me one of my biggest days last year when I rode her at Aintree to win the boys' race. I never thought I'd get the chance to get back on her, as she'd be running in Listed races and I wouldn't be able to use my claim. "It was great to get back on her today so it's huge thanks to the boss and Mr Gaffney (owner) for putting me back on her."